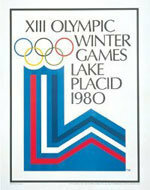 It was 48 years since Lake Placid last hosted the Winter Games, and since then the Olympics had developed on all fronts. Twice as many nations now took part, and there were over four times as many competitors. In a little town of 3000 inhabitants it was hard to justify major house-building projects for the visitors. As a result, many competitors were lodged in the newly-built prison. The fantastic Eric Heiden won all five speed skating events. Skater Bjørg Eva Jensen won the 3000m and was Norway’s only gold medallist.